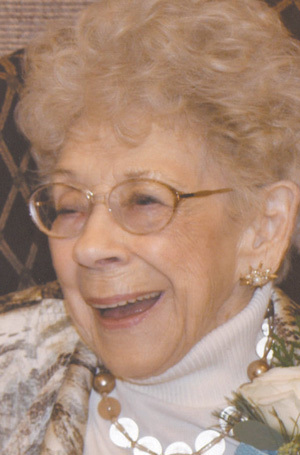 Twylla Dawn O’Dell Allred passed away peacefully at her home in Grantsville on March 30. She was born Dec. 7, 1922 to Howard Barney and Della Woolley O’Dell in Salt Lake City. She graduated from Granite High School. She married Alvin Earl “Red” Allred on July 23, 1942 in Boston, Mass., while he was serving in the U.S. Navy. Following Red’s honorable discharge, they settled in Grantsville. Their marriage was later solemnized in the Salt Lake Temple. Toni was very active in the LDS church, serving in many callings. She was active in the community including being the first woman elected to the city council, on the committee that formed the Grantsville Federal Credit Union and the Grantsville Senior Citizens, Cowboy Club member, Daughters of the Utah Pioneers (Deseret Camp), Beta Sigma Phi and the Democrat Party. She was preceded in death by her husband, daughter Dawn Joan Davis, brother Jack O’Dell and Myrle O’Dell Jefferies. She is survived by son Jack (Debbie) Allred, daughter Patti (Don) Johnson, son-in-law Glen Davis, 12 grandchildren and 25 great-grandchildren, sisters-in-law LouAnn (Robert) Blakely and Nancy O’Dell, nieces and nephews and many friends. A viewing will be at the LDS chapel in Grantsville located at Church and Clark streets from 10 to 11:45 a.m. on April 5 prior to services at the church at noon. Internment will be at the Grantsville City Cemetery. Thanks to the staff at Diamond Jane’s Assisted Living, Harmony Hospice and the staff of IMC Hospital.